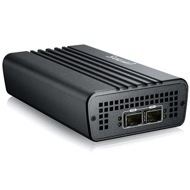 The Promise Technology SANLink2 Thunderbolt™ 2 to 8G Fibre Channel bridge is a groundbreaking, out-of-the-box solution that revolutionizes how users connect to a Fibre Channel SAN. For the first time, portable and desktop systems previously unable to connect to a high-speed Fibre Channel SAN can now do so using Thunderbolt 2 technology. 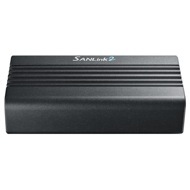 SANLink2 provides dual 8Gbps Fibre Channel ports that can be used to connect directly to an external Fibre Channel storage device or to a storage area network (SAN) using a high-speed Thunderbolt™ 2 I/O port. Each adapter features full-duplex capable FC ports that automatically detect connection speed and can each independently operate at 1, 2, 4, or 8Gbps. SANLink2 is fully compatible with Thunderbolt™ 2 technology, is qualified for use with OS X, and works with full hot-plug capability. 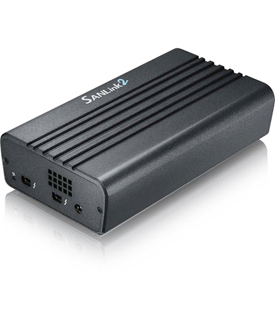 Dual Thunderbolt™ 2 I/O ports enable SANLink2 to daisy chain up to a total of six Thunderbolt devices including products such as Promise Technology Pegasus2 Series Thunderbolt™ 2 RAID storage systems. 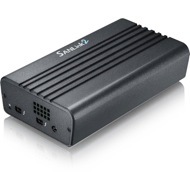 SANLink 2 removes storage bottlenecks for portable and desktop systems that were once unable to connect directly to a Fibre Channel SAN. By using SANLink2, editing files in real time in native uncompressed formats has become a reality, thus removing the need for costly rendering time due to proxy editing. In addition, access to low-latency, high-bandwidth storage reduces file load times, allows for instantaneous response time during timeline scrubbing and reduces the amount of time required for large media file transfers. 3.62" x 6.40" x 1.69"